Last week, the Trump administration signals that it will allow Assad to remain in power in Syria. This week, a poison gas attack on civilians occurs in Syria (I warned of a mass-casualty attack this week, here). The usual establishment talking heads immediately blame the attack on Assad. This is terribly convenient for the neocons and various other warmongers who are pressuring Trump to expand the wars in the Middle East. It is terribly inconvenient for Assad, who by many reports was within weeks of containing the ISIS-affiliated rebels in his country. Therefore, it appears that, based on motive, it seems likely that the gas attack was a "false flag attack" by the enemies of Assad and supporters of ISIS. Is Trump sharp enough to see what is (most likely) happening? His recent about-face on Syria suggests, worryingly, that he may not be. Pallas in the horoscope represents intelligence and decision-making processes. 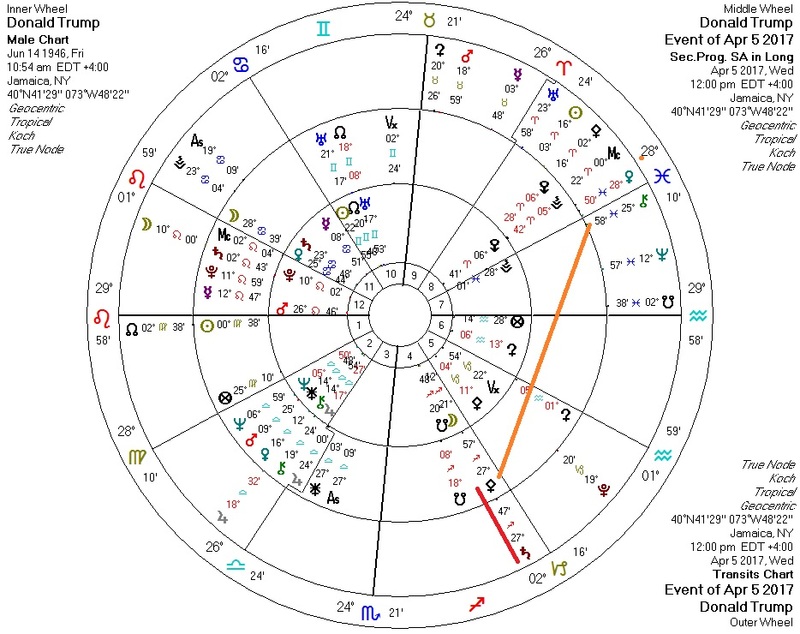 Here we can see that Trump's progressed Pallas is under very strong pressure by hard aspects from Saturn and Chiron.